Maybe I'm dreaming. But I have this feeling that the Berlin School style, the progressive EM which for a long time was cooking in the German caves and basements seems to resurface. The Facebook pages abound. Radio programs get multiply and solid releases are hopping up to the ears at almost every week. 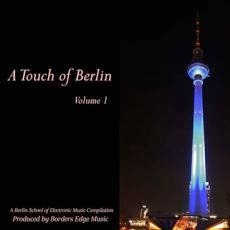 For the Canadian independent label Borders Edge Music, it's the right time to release a compilation on the genre entitled “A Touch of Berlin Vol. I”. I'm maybe going to make you smile, or to shock some of you, but with all the genres and the sub-genres which are teeming in the studios and are produced over the last couple of years, the collective Borders Edge Music is what it gets closer to Software EM fabric and of their numerous music styles which lived under the same banner; Innovative Communication, after the Peter Mergener years. Lot of styles and a lot of music. Borders Edge Music presents good and lively EM, from e-rock to IDM and New Age by passing in the New Berlin School range. There are for all tastes. And as in these Software years, the compilations have a thematic nature, as DreamScapes and Wavefront, or are making a brief glimpse on the albums appeared each year. Mixing so all these genres which sparkle and charm the tastes of all and each in the beneath the same sign. As we can guess, “A Touch of Berlin Vol. I” aims at plunging the listener into the territories of Berlin School. But I would rather say that it is much more about a compilation of New Berlin School and of E-Rock tracks, than of pure Berlin School where the minimalist sequences are generative of ambient rhythms which inter change their forms in approaches more progressive than harmonious. Having said that, “A Touch of Berlin Vol. I” is a good compilation and an excellent way to get acquainted with one of the numerous facets of this Canadian label. And that begins with tears of synth which squeak by intertwining their waves. A muffled rhythm, raise up on a heavy and insistent pulsation, pounds laconically while sequences flicker with liveliness, ready that they are to smash the barrier of a structure of rhythm which will explode in a e-rock a la Tangerine Dream. "Floh" is pulled from the album Cosmic Touch, which is very well represented here with "Astral Gates", he superb "Nexus 6" and the solid "Encounter at Proxima 5", showing all the depth of this album which appears undoubtedly among the pleasant surprises of 2013. Kuutana also takes out a pearl of his Fantastic Stories album with the powerful "The Caves of Steel". This is a solid mix of e-rock and New Berlin School here. "Infinity Improbabilities" is the only vestige of Quantum Earth album and is doubtless the track which sticks the most to the ambiences of the Berlin School. I was very surprised by the heaviness of the circular rhythm of "Emerald Path", a very dark track with sinister moods of tension or horror movie which nests on the Walking Sun album released in 2013. An album that I never heard and if "Emerald Path" is a faithful reflection, that deserves an investigation. Another unknown track to me is the very ambiospherical "Ion Storm on Jupiter Station" from the Undiscovered Shores album, also released in 2013 which would deserves amply its place on a Berlin School compilation. But this track is at its place here. With "Infinite Improbabilities", they mix a little the New Berlin School and retro Berlin School genres with a skillful insertion between the rhythms of fire which make this beautiful and very fair compilation of Borders Edge Music rocking the house down and drawing dreams beyond stars.